As last year began, we had no idea what we were going to do. We had decided that we would need to sell our home and reduce our costs, and we were finally in agreement (I had resisted) that we needed to downsize, since our youngest child was in her last year of college. There were both financial and physical concerns, in a house that, truly, was bigger than we really needed now, that had three flights of stairs. We were thinking in terms of summer, and the work we would need to do in order to put it on the market was pretty daunting. I had no idea how we could make this happen in six or seven months. I didn’t know how we could do it at all, to tell the truth. It became apparent by the end of October 2012 that we weren’t going to be able to make it until summer. Lengthy unemployment meant that we would hit the end of our resources sooner than we had hoped. We had a looming crisis, and no certainty of being able to solve it. We might simply end up losing everything. I’ve tried to learn to not worry when the Lord tells me not to. That has not been an easy lesson to learn, but I think I finally have it pretty well; I hope I do, no matter what happens. Our turn was done, and thirty-three years was a long turn. He would take care of us again, and still. 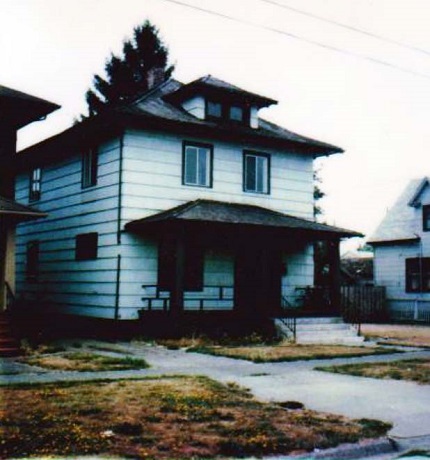 Way back in our two years in south Seattle, before work brought us to Tacoma, we had one of those times when things were really tight; and tithing didn’t always get paid, always with the intention to make it up next time. When the calendar year ended, we were much more behind than we had realized; we had paid less than half of what we owed the Lord. That was an unbearable position to be in, and we had to find a way to make it right. I had a modest account set up by my grandfather, which we left alone as our savings for a down payment on a house someday. It made a little money each year. We used it to make things right with our tithing obligation, and were scrupulously careful not to get behind again. My husband had an immediate blessing after that, with the ins and outs of a company car, so we were grateful. We felt a lot better, regardless of that small windfall, knowing we had done what was right. It didn’t look like we were ever going to be able to buy a home, even after my husband found a new job. But there was a federal program we had looked into earlier, called the Urban Homestead Act, which the city had chosen to implement. The first time, we made barely too much money for our family size to qualify. Now we had three children instead of two, and a small cut in pay. We were accepted. The program provided that houses that carried a government loan and went into foreclosure would be offered to contractors for the remainder on the mortgage for ninety days. If they didn’t sell, they were turned over to the participating city. The city then chose recipients who had to bring the homes up to code and live in them for three years before getting title. If you had to leave them earlier than that, you were just paying rent. If you could prove that you were creditworthy but without the income to qualify for a loan in the prevailing market, you could make the list. Houses were given for the cost of repairs, which they loaned you, and assessed by family size and number of bedrooms, period. It didn’t matter what the square footage was, or whether you were okay with a smaller space. If their formula said four bedrooms, you couldn’t plead for eligibility for a three-bedroom home. That year, there were only three homes available — two with three bedrooms, and one five-bedroom Victorian. We were listed for the drawing of a three-bedroom home. One was small, no basement, a single story. The other was what is called an American Foursquare — a square box with a pyramid roof and a front dormer. It had two full stories, a basement, and a walk-up attic. We were to list first, second, and third choices. (Some years there had been a good number of houses.) A date was set for a drawing. I took the kids down to the city offices on the appointed day, and we sat and waited anxiously. The chosen official put all the qualifying names for three-bedroom homes in a coffee can, shook them around, and pulled out and read a name. Our name. We got our first choice of properties. We had multiple walk-throughs with the person in charge of the program. There was a time limit on the repairs, and we had no choice of contractor; the city simply put the listing up for bids. As I remember, there were something like forty-eight separate work orders. The house had been vacant for two years, but there had been squatters who had set a small fire in the master bedroom, presumably for warmth. It was built in 1914, and needed rewiring and lots of other things, but many of the other houses over the years of the program had been in worse shape. We had to pick paint colors, and after various rental apartments with plain white walls and moss green shag carpets, we indulged in colors that wouldn’t raise an eyebrow now, but certainly did then. We had an allowance for carpet, vinyl, and kitchen appliances. We bought a real dining room table, and a washer and dryer. We had, and still have, a firm conviction that our home was a blessing because of our sacrifice of our down payment savings to make good on our tithing. Over several years of this housing rehab program, more than ten percent of the houses went to members of the Church, as far as we could identify. The Lord put the program to good use to bless faithful families. We had no question that the Lord gave us the house. We raised our family there. Those three children became six; as our family grew, we looked at selling, and instead, twice, we remodeled and finished space in the attic and basement. If it was time to pass it along now, then that was all right. I still had no idea what we were going to do, or where we would go, but it would be all right. And it was, as His hand provided for us and set us up where we are now. His gifts continue.